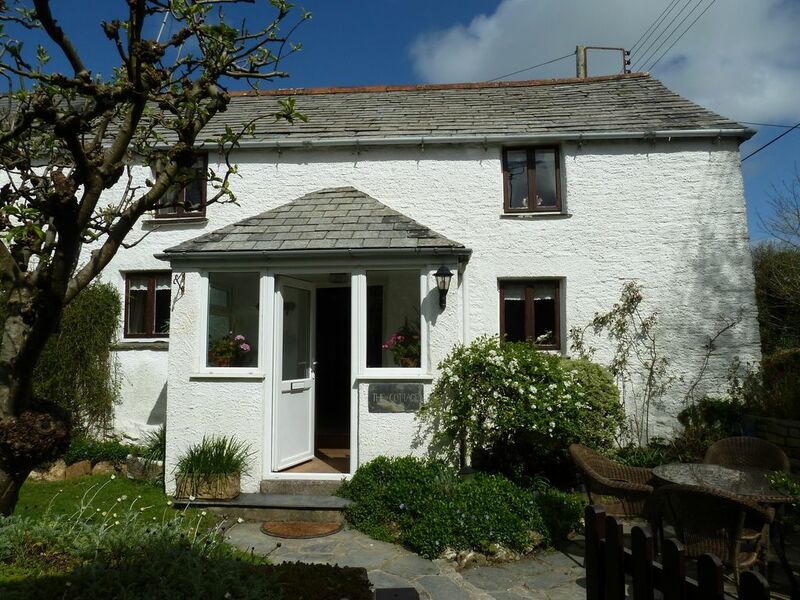 Romantic Cottage with pretty sunny garden for 4 nr Padstow with private parking. Ideally situated for exploring Cornwall, this charming romantic little cottage is semi- detached in the rural village of St Issey, and end on to the lane that leads down to the scenic camel trail (2.5 miles). Only 4 miles from the unspoilt fishing harbour of Padstow with its famous Seafood restaurants, boat trips and art galleries. The beautiful sandy beaches of the stunning North Cornish coast is also only 4 miles away and offer many exciting beach and surfing activities, along with some fantastic coastal walks. Enjoy your holiday in this well furnished and 'own home' property that combines all the modern comforts needed for a relaxing holiday, with a cosy cottage feel, gently decorated in neutral colours. The small pretty sunny garden is enclosed with patio area with table, chairs and BBQ, perfect for al fresco summer dinning or relaxing afternoons. The sunny porch has two chairs and leads to the open-plan, full length of the cottage living/dining room with character Inglenook at one end, comfy chairs and cosy open fire at the other. There are plenty of magazines and books in the bookcase, along with local maps, walking books and holiday suggestions and the dresser contains a selection of family games and jigsaws etc There is Freeview TV and DVD player with a selection of films, and if you are unlucky enough to have to bring your work with you, there is Wi-Fi broadband. The well equipped fitted kitchen has a dishwasher, fridge, freezer, electric cooker, and microwave, and table and chairs. The separate loo is next to the bathroom with a shower over the bath, suite and heated towel rail. Whether your holiday is with family or friends, for beach holidays or an out of season walking break, The Cottage will make the perfect holiday retreat. Separate Loo with Toilet.. The bathroom has an over-bath shower, wash hand basin and heated towel rail. Small private parking space available next to the property. More parking down the lane. Beautiful, cosy cottage. Everything you need and more. Had a fantastic stay, everything perfect including the weather. Couldn’t have asked for more. This cottage is absolutely amazing, it is so lovely and cosy, it was perfect. We honestly didn’t want to leave . In a lovely little village, and a lovely pub around the corner, the ring of bells, and the food there was delicious. Very highly recommend both the cottage and the pub, we can’t wait to go back. I would give it more than 5 stars if I could. The cottage was easy to find from the directions and tucked away in a quiet lane. There is parking but you need to get everyone out of the car and unload before you park in it as very very tight unless you have a very small car. You wouldn't fit an estate car or people carrier in it I wouldn't imagine. The cottage was beautiful and clean and had everything you would need in it. The only downside for me was the toilet being downstairs. Would highly recommend this as a holiday property and the location was brilliant for exploring all of cornwall. Really good cottage very clean and situated in a good location to go to the local beauty spots.Pet friendly too and also a nice seating area outside to sit and enjoy an evening drink or two.We would definitely come again! Beautiful cottage tucked away in idyllic position away from hustle and bustle of life.Ideal location for exploring north coastal areas of Cornwall.Every amenity catered for within the cottage and lovely sunny secure garden to wind away .pleasant evenings knowing our three greyhounds were safe and secure.Very dog friendly pub short walk away providing lovely local atmosphere with good pub grub.We all experienced a wonderful relaxing holiday and would not hesitate in recommending The Cottage to friends and family. Ideally situated for exploring Cornwall, The Cottage is a delightful Cornish Cottage, situated in the quiet rural village of St Issey, only 4 miles from the unspoilt fishing harbour of Padstow with it's famous Seafood restaurants, boat trips and the scenic Camel Trail cycle way. The beautiful sandy beaches of the stunning North Cornish Coast are also only 4 miles away and offer many exciting surfing activities.